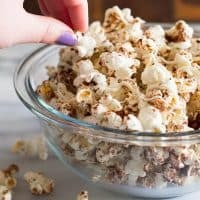 If you’ve had a long, tiring work week, a good movie, a glass of wine, and a bowl of this Cinnamon Bun Popcorn is the very best way to celebrate its end! For Christmas this year, family on the East Coast sent a big box of gourmet popcorn. It was basically the best Christmas gift ever because I love popcorn, and I love choices, and this was just a giant box of different popcorn flavor choices. There was everything from jalapeño-flavored kettle corn to chocolate-covered kettle corn with crushed potato chips (POTATO CHIPS!). 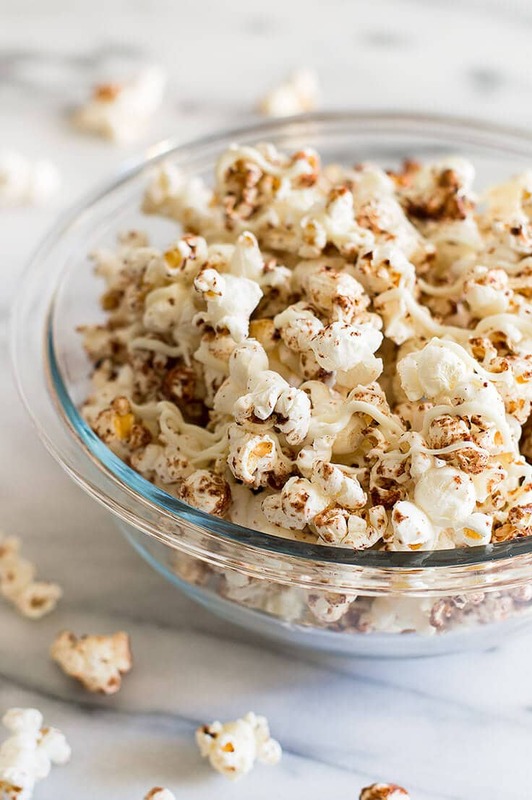 But my favorite flavor of the bunch was some fabulous cinnamon bun popcorn, and since I love making kettle corn, obviously I was going to try and recreate it here on the blog. But since I do know, I’m sharing it with you so we can all eat over-the-top popcorn together. The recipe is really simple. 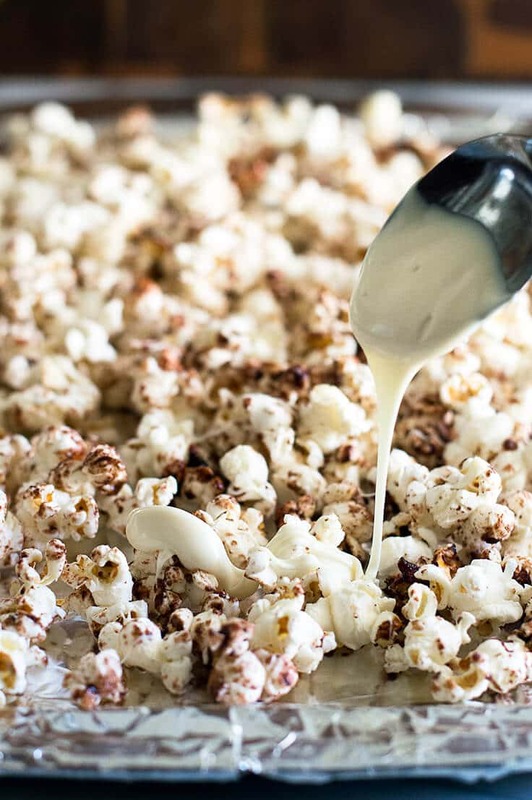 It’s just kettle corn made with cinnamon sugar instead of plain granulated sugar and then drizzled with white chocolate, but it’s about a thousand times more decadent. Use a large pot, at least 3 quarts. It’s going to seem much too big, but this gives the popcorn space to move as you shake the pot, so no sugar is trapped at the bottom burning. If your pan has a very tightly fitting lid that doesn’t allow steam to escape, pop the lid open just a fraction of an inch so steam can escape (I cover the lid handle with a towel and hold it on with my left hand while I shake the pan with my right). 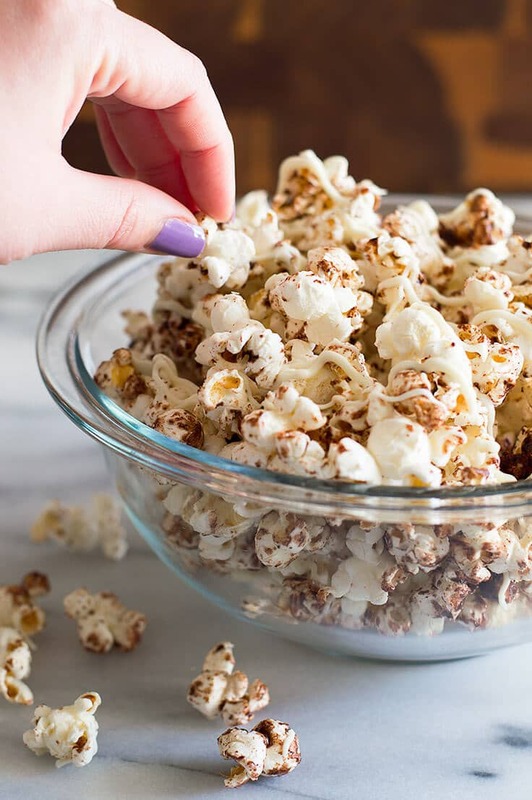 If you find your stove-top popcorn isn’t as crunchy as you’d like, it’s probably trapped steam making it soggy. Finally, have a tray ready dump your popcorn onto before you start. The popcorn should be poured out of the pot as soon as it’s done popping since the residual heat can still cause the sugar at the bottom of the pot to burn if left sitting. 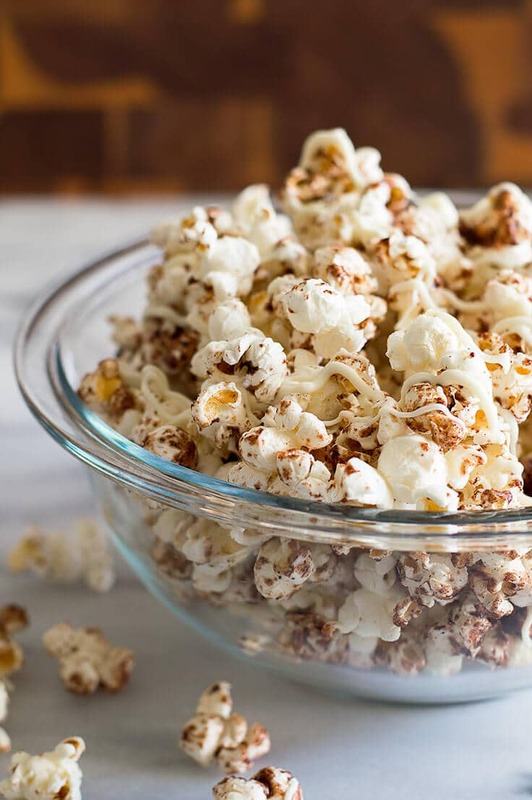 If you've had a long, tiring work week, a good movie, a glass of wine, and a bowl of Cinnamon Bun Popcorn is the very best way to celebrate its end! Line a large rimmed baking sheet with foil (for easy clean up) and place on the counter. In a small bowl, stir together granulated sugar, cinnamon, and salt. To a large heavy-bottomed pot with a lid, add oil (if oil is in its solid state, melt over medium heat before proceeding) and 3 kernels of popcorn. Cover and heat over medium-high heat (medium if your stove runs hot) until you hear all 3 kernels pop. Add the rest of your popcorn and shake pan for about 5 seconds to coat the kernels. Sprinkle sugar mixture over the popcorn as evenly as you can. Cover and shake for 3 seconds, rest for 3 seconds, repeat, until popcorn begins to pop steadily. Once that starts, shake pan mostly continuously, pausing occasionally to listen for breaks in popping. Once there is about a 2-second break between pops, pull from heat. Transfer popcorn immediately to your prepared baking sheet. In a small bowl in your microwave, heat white chocolate for 30 seconds and stir until smooth. If necessary, continue to heat in 15-second bursts and stir, until smooth. *Vegetable or canola oil is also fine. Got here from your instagram. This looks great! Thanks for the advice about being careful not to burn the kettle corn. I want to make something special for my extended family reunion, and I’m going to need a lot of this. This recipe seems pretty simple, but I’m so bad at cooking that I’ll probably ruin it anyway. Maybe I’ll just buy gourmet flavored popcorn wholesale for the family reunion.